It's been almost two months since we started the seeds for this year's garden and we're itching to get them in the ground! We basically have no idea what we're doing but figured it was better to jump in than to put it off. We've already been learning a lot along the way, and one thing we've struggled with is getting enough light for our plants. We put them in the sunniest window in our house, but even that doesn't seem to get enough hours of light during the day and the light doesn't reach the plants toward the back of the table (meaning we had to keep rotating the cups trying to get all the little fellas some sunshine). I'm thinking maybe next year we'll need some kind of light to help them grow instead? That would keep them warm because I suspect our house has been a bit on the chilly side for them.... 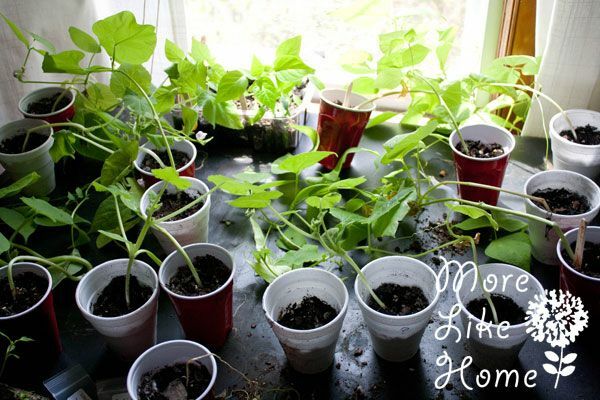 Even so some of our more viney plants like pumpkins, beans, and zucchinis were able to grow around the window and really seem to be doing well. But several of our other plants are still just so tiny and weak. 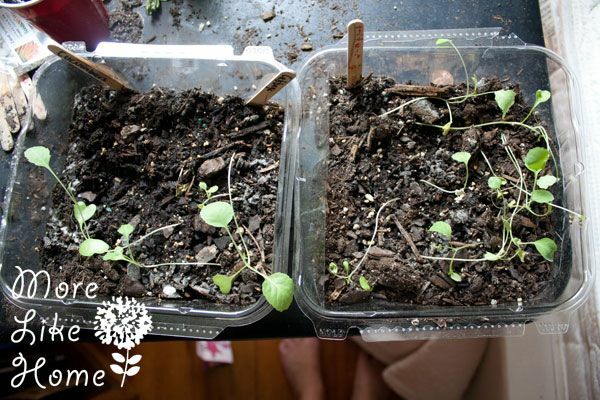 These are cauliflower, broccoli, and cabbage that just aren't doing well at all. It may be too late to save them but we are going to try! 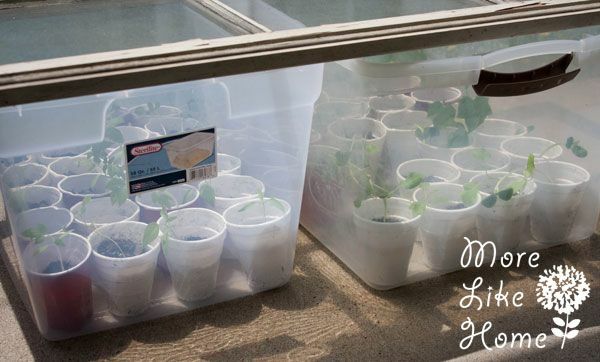 At the suggestion of a pro-gardener friend we decided to try a small outdoor greenhouse to really get them sunny and warm. 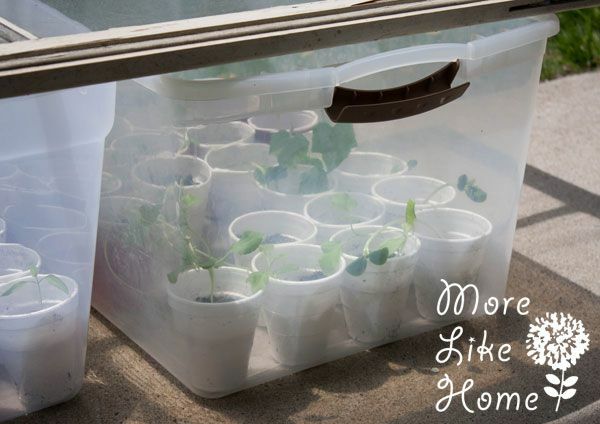 Since we don't have any greenhouse or a chance to make something if we want to try and save these babies in time for planting, we came up with this little make-shift solution. We just put the plants into some clear plastic tubs (clear so lots of light can get through) and put an old window across the top. BOOM. Done. Now we just keep them watered and wait. Most of the time we leave the window on top because they need to be protected from the wind & the squirrels, but on nice days when we're playing outside I take it off for awhile to try to acclimate them a bit. I don't know if it's the right thing to do. It feels right to me, but we all know I'm flying by the seat of my pants here. 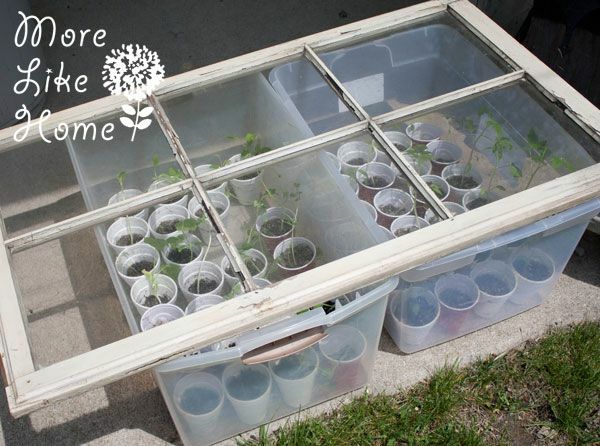 If you don't have an old window, we added a third tub that had a clear lid and just put the lid on. So hopefully that works out. Now we just let these guys warm up a little and hope we can plant them in the next couple weeks! Anyone else start seeds this year? How's it going? 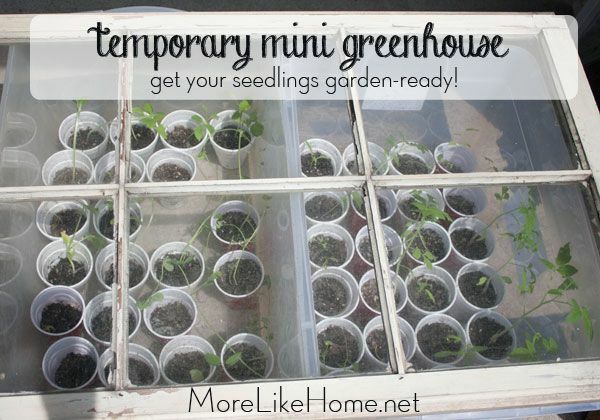 Hi there - I realize this post is a few years old...but how did the mini greenhouse go? I'm looking to try something similar to get an early start on my flowers for next year. Would love to hear feedback! Dinosaur Birthday - on the Cheap!